Man’s sterling silver handmade ring with black diamonds, dinosaur bone inlay and black onyx inlay. We just completed this striking new man’s dinosaur bone ring design featuring black diamonds, dinosaur bone and black onyx set in sterling silver. This handsome bone ring has 3 round black diamonds weighing .30 carats channel set to one side of the ring, leaving a long section of the ring for inlay. The black diamonds look great with the inlaid black onyx and dinosaur bone. 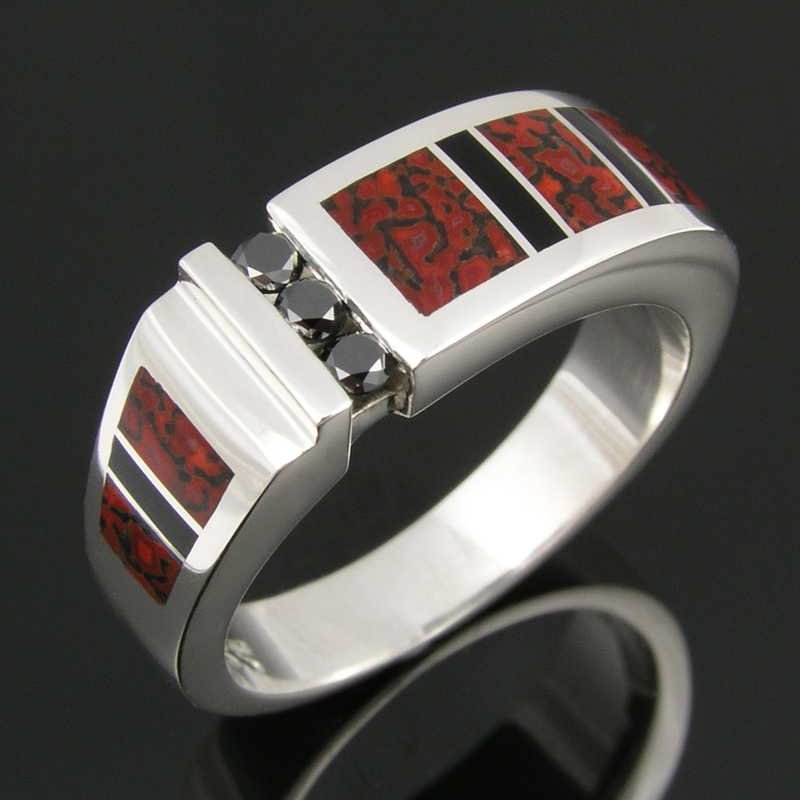 The ring is inlaid with 6 pieces of striking red celled dinosaur bone with black matrix. Four sections of black onyx divide up the red dinosaur bone and bring out the black matrix in the gem bone. This handcrafted dinosaur bone inlay ring is 8mm wide and tapers to 4.3mm at the bottom. It is hand signed “MMH” by Mark McBride Hileman and stamped sterling silver. 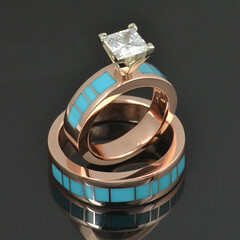 The ring pictured is a size 10 1/4 but is available in other sizes by special order. 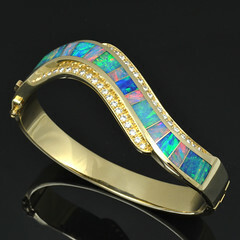 This design may also be customized by changing the inlay stones or switching the black diamonds to white sapphires, white diamonds or blue sapphires. 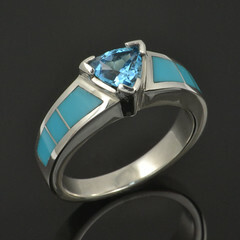 Please allow 4 to 6 weeks for special orders on this ring. Gem dinosaur bone like this is becoming more difficult to find so start your collection today! For more information, photos and purchasing information please visit http://www.etsy.com/listing/49489605/sterling-silver-black-diamond-ring-with or go to www.HilemanSilverJewelry.com .